The Inverter Store specializes in offering extra-large solar kits perfect for powering any demanding environment, from your large house to your expansive business. Our convenient extra-large kits can be tailored to your 30KW-200KW inverter chargers. Whether you want to build a custom solar panel kit to meet your very specific needs or find a bundle that works perfectly for you, you’ll find that The Inverter Store’s selection and expertise will help to simplify the process. Save up to 12 percent when you purchase solar equipment as a kit. Here’s how it works: simply choose the pure sine inverter charger that suits your specific needs and then add your preferred solar package and batteries. Our large inverter chargers come in either 208 VAC three-phase or 240 VAC split-phase options. Both can be customized to create a one-of-a-kind solar package just for your needs, with a bundle containing either 18 or 24 high-quality solar panels plus a charge controller and all the cables you need. Once you select your panel bundle, simply add your battery package and we’ll send you everything required to create a large solar setup tailored to your home or business. The Inverter Store is more than happy to work with you on a special order solar kit if you don’t see an option here that suits your needs. 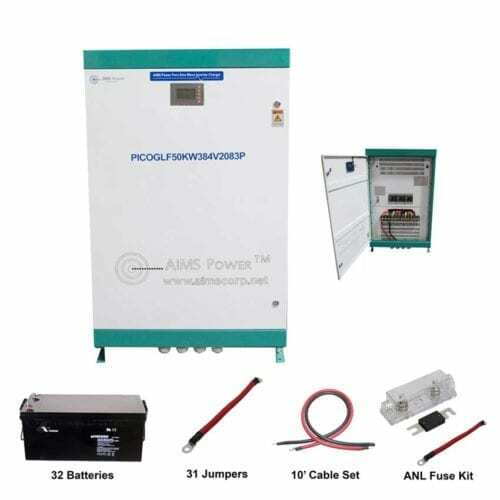 Our 30KW, 80KW, 120KW and 200KW inverter charger kits are available as special order only and ship within 12 weeks. You can easily add on ground mount solar racks, extra cables, solar charge controllers and additional panels from our solar products department to create the perfect kit for your needs and budget. The Inverter Store offers free shipping on all solar kits in the contiguous United States.